Compression Clothing: Not The Magic Bullet For Performance : Shots - Health News Tight elasticized socks, sleeves and T-shirts supposedly make you a better athlete. But alas, science is pouring some cold water on those alluring claims. 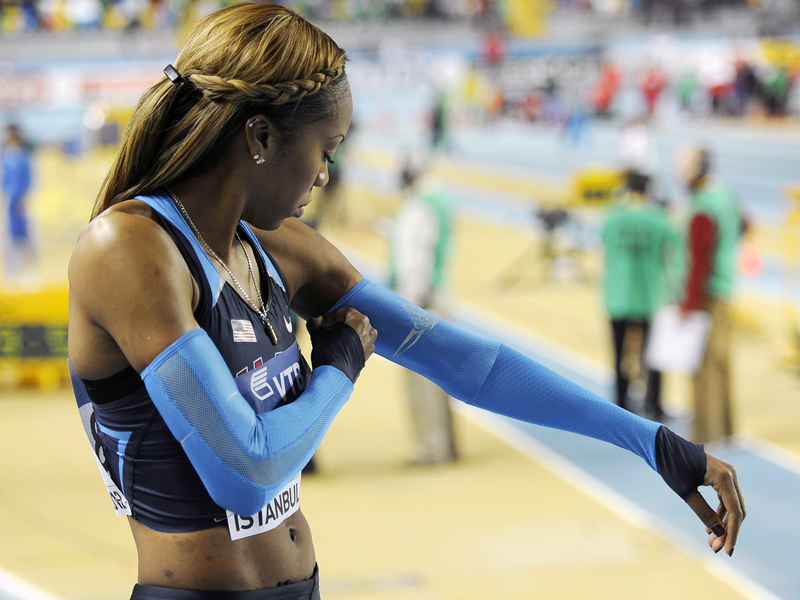 Olympic gold medalist Sanya Richards-Ross pulls on compression sleeves before a 400-meter race at the World Indoor Athletics Championships in Istanbul in 2012. Maybe you've seen them in the gym, or even squeezed into them yourself: super-tight T-shirts, leggings, knee and calf sleeves, even tube tops. More and more athletes are wearing compression garments, hoping they will improve their performance and recovery. But do they work? This is a question Abigail Stickford, a postdoctoral researcher at UT Southwestern Medical Center in Dallas, wanted to answer. She conducted a small study using compression calf sleeves. Decades ago these were marketed to people with circulatory problems, but today they're also aimed at athletes. Manufacturers claim these garments will help improve blood flow and oxygen delivery to your muscles. Stickford says, "Those things in theory would really benefit your performance." To test the claims, Stickford gave 16 endurance runners a pair of calf compression sleeves. Then she strapped on masks and monitors to measure the runners' gait and oxygen intake. The same routine was done without the calf sleeves as well, and "we found nothing," Stickford says. No difference. "When we looked at the averages of our group of runners, all the measures of running gait were exactly the same with and without compression," Stickford says. "And the measures of efficiency were exactly the same." Here's where it gets interesting. Two men who did show improvements while wearing the compression sleeves were the ones who believed the garments aided in training, racing and recovery. "The placebo effect is a real effect. It affects performance," Stickford says. "So if you think these garments work, there's not really any harm in trying them out." That is, if you want to shell out the cash. A long-sleeve T-shirt might go for $60, a "core band" that looks like a tube top for $40 and a full body suit for several hundred dollars. Stickford's study, published in the International Journal of Sports Physiology and Performance, was small. But larger research reviews back up the idea that compression clothing has little effect on performance. So what is it good for? Well, possibly recovery. Compression is effective as a post-exercise recovery measure, says Daniel Cipriani, an associate professor of physical therapy at Chapman University. "Because it helps to keep down some of the swelling that occurs with all the blood flow," he says. Cipriani co-authored a study in the Journal of Chiropractic Medicine on cyclists who used compression and posture shirts while riding. "During the ride, most of them liked the shirt in terms of making their back feel less fatigued and keeping them in a good posture while riding," he says. "But the majority felt it was even more useful after the ride as a recovery shirt." Cipriani cautions that his study looked at the perceived effects of compression shirts — they didn't measure results. So it is possible that putting on the new garment had more of an effect on psychology than physiology. Still, he says, it's worth giving compression clothes a try. While there's no evidence the clothing improves performance, there's also no evidence it's harmful.